Many in India now and in past and probably in future will ask this question that why our father of nation choose non-violence as the basis of his movement. Many say it is this non-violence that is the cause of all problems. Also many say it is this non-violence that caused division of India. Another many say it is this non-violence that made Indian image tarnished among world nations as weak and meek. Let us examine the issue of non-violence. This issue cannot be comprehended unless we understand the freedom struggle of all phases. We are defining the freedom struggle as a fight with an aggressor(s) whose intention is to rob plunder and take away resources of this country (human or natural) by establishing a temporary, proxy or sporadic administrative centers of control within the targeted country that is India. These above classifications were done based on through historical research and quantitative data as well as on the extent of Indian territory loss, human lives loss, resources plundered. Within these sub periods there are many wars fought by Indian Kings and British between 1757 to 1857. By 1857 under theory of paramountcy 51% of the Indian territory was ceded to British, 49% of the territory was still in the hands of Indian Kings (wrongly termed as princes as for British only their king is king and all others even though they held territories more than that of England are princes). Also ceded to the British was the authority to import weapons by the Indian kings as British promised uninterrupted supply of heavy weapons if in case any other European nation invades them. British became sole suppliers of modern weapons needed for all Indian kings. Under their occupied territories British make sure all the metallurgical furnaces were destroyed which could be used for any weapon manufacturing. Weapon making castes/workers were summarily executed. Local territorial history of culture of warfare was summarily wiped out. Orders were passed banning bearing arms (citizens may revolt), owning horses for personal transportation (this gives mobility) under British territories. The sole weapon that could be held by any is a kitchen knife single side sharpened ( and the blade should not be not more than 6 inches ). Under the British Occupied Territories of India (BOTI) (51% of India) British started an exhaustive comprehensive study of how to prevent anger from erupting and if erupted how to redirect or subdue the anger of their subjects from affecting British interests. The task was given to two brilliant personalities. One was a British educationist Robert McCaulay whose job was to recommend on methods of preventing anger by manipulating education reforms. The second personality was David Alan Hume, a senior British Intelligence Officer who was assigned the work of recommending to prevent incidences such as First War of Independence in British occupied territories. With the recommendations of McCaulay in the British occupied territories the traditional medium of instructions Sanskrit and Persian were banned and English medium education and associated dress was introduced. A gradual discredit of all that was Indian started in education and on the ground literally every note-worthy achievement of Indian civilization of centuries was virtually razed to dust. Slowly but steadily by 1890 a generation of Indians in British Occupied Territories of India (BOTI) started believing that whatever that is ‘English’ is synonymous with Development and English is equated to science and scientific development. It is this generation that paved the way for conquest of India under the plan created by the second personality David Alan Hume. David Alan Hume was a veteran British Spy chief in India and studied intelligence reports of past 35 years literally 35000 documents filed by British officers all across India, Indian social settings, castes hierarchies and their abilities to fight their interrelationships. His recommendation was there should be an Indian intermediate agency (agencies) that can claim superior to all other Indians and handle the anger of Indian masses of BOTI. He recommended these agencies be filled with absolutely loyal English educated anglophile Indians who must be monitored by seasoned British intelligence officers (both British and Indian origin specially trained for this purpose) for not wavering from their goal. Even if they waver these embedded spies will discredit them. The sole purpose of these agencies is to divert the attention and anger of population of Occupied Territories towards diversionary fratricidal ideologies promoted by the organizations set up by the chosen men of British Intelligence. For this a careful selection and nurturing of candidates from young age was necessary. British used the schools set up for this purpose. First they erased the memory of cultural history of the young boys. Then they indoctrinated them that British and European systems were superior. Later they were instructed to save the heathen or the poor Indians suffering from the lack of enlightenment. This process culminated by 1890 in creation of three organizations and dozens of movements. Indian National Congress directly under David Alan Hume, Hind Maha Sabha, Indian Muslim League. Many movements like Brahmosamaj, Arya Samaj, Theosophical Society etc are also offshoot of this strategy. For most of these leaders it was a time pass in spare time to discuss about the plight of fellow Indians about whom they never know and find solutions with the British leaders in summer and Christmas parties. The intellectual void this generation experienced under British education made them neither to live with their own brothers Indians whom they thought inferior not let them live with British whom they held superior. This is the lost generation of India from 1890–1950 and unfortunately they led our fates for next six decades. This is the precise anarchy when first Mohandas Gandhi entered India after violently expelled from South Africa. In South Africa he witnessed the extreme brutality of the British forces against innocents. In fact it is the same British who were founders of mass slave trade in modern times who exported millions of Africans to continental America as slaves. In Africa despite having secure land routes the African National Congress at its beginning cannot mount any credible armed challenge to the British. With this background when Gandhi approached Indian problem he was awe struck. Almost all land routes to any European power which can supply weapons was almost nill as all of these routes were under British occupation. Armed Struggle means uninterrupted supply of weapons, unending supply of fighters. This supply should be either domestically made or obtained from foreign sources. With the education system under British in disarray the students were not able to produce any guns needed on the scale for an Independence struggle nor they could set any factories to produce them. To depend on foreign suppliers for a struggle against British was suicidal. Without weapons supply creating brigades to fight is like sending cattle to British slaughter houses. Also Gandhi realized that the then congress was filled with British agents and spies. He also realized that the Indian kings have agreements that prevented them going against British. By this at least they were able to save 49% of the Indian land and its resources being plundered by British. Gandhi correctly assessed that once the freedom struggle starts he can bank on Kings for moral support and logistical help. With this in background he set the wheel of Independence in motion on a unique notion which he coined himself – Non Co-operation in non-violent way. Keeping the above pathetic scenario of the country, as an ablest field marshal Gandhi theorized that the only way to minimize tragic human loss which British will not hesitate to hoist on his fellow country-men was to start the battle of the mind than weapons. He said do not pay taxes. Do it yourself. Start with salt. Do not resist arrests go to jail. Like the ablest general Gandhi was able to correctly calculate that to win the war of Independence against British their financial resource base and thus their ability to fight should be cut off. Minimize the resource flow into British coffers and drain the resources in to spending on unwanted issues without firing a single bullet. By self-help in creating cotton salt etc. he cut the revenue streams that supported British operational machinery. And with endless non resisting self-courting arrests and subsequent maintenance of the arrested; drained the resources of enemy into unwanted events. South Africans took the violent route at the same time. Their independence was granted only in 1980. Thousand were killed many more maimed whole country side lay desolate; for the population and death toll ratio was staggering. In India from the day Gandhi entered congress in 1920 it took 27 years for achieving the victory. With no communication systems, transport infrastructure with dozen linguistic groups Gandhi achieved the success in the battle with the victor of world war 2. He was the best strategist and an ablest general. He took a weapon a walking stick. His battle technique was Non Co-operation in Non-Violent way. His army was the Citizen Soldiers. His concept was Total war but he was careful in choosing the terminology. He called his struggle as Satyagraha – Pursuit of Truth; even it warrants angry pursuit. To understand him one has to understand war and peace and the strategies to win. He is the best general who used minimum human loss and resource loss to win a battle. 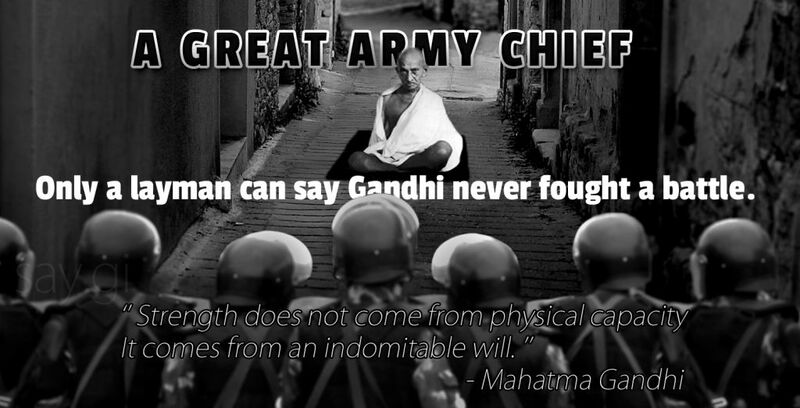 On that account only a lay man can say Gandhi never fought a battle.